The Kenyans had a good run. But the country’s Chicago Marathon win streak of nine consecutive races is over. Ethiopia's Tsegaye Kebede outran, outhustled and outlasted all competition – over 30 elite men’s runners and 38,000 total participants – to win the men’s marathon with a course-record time of 2:04:38. 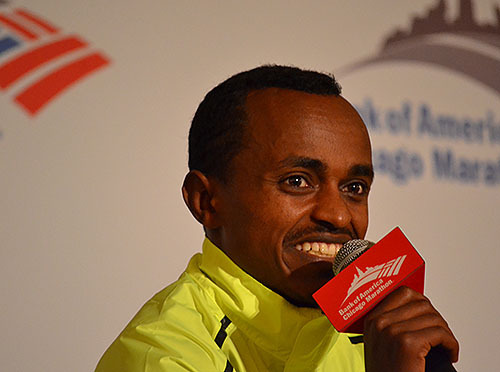 Kebede, 5-foot-3 and 25 years old, is the first Ethiopian to win the Chicago Marathon. Ethiopians rounded out the top three, as Feyisa Lilesa placed second (2:04:52) and Tilahun Regassa (2:05:27) was third. With his back perfectly upright, and his arms and legs furiously pumping, Kebede separated himself from the pack in the second half. “When we passed halfway, it was too slow of a race,” Kebede said, adding that he pushed himself harder after the pace-setters dropped out after the 16th mile. Slideshow: Team coverage of the 2012 Chicago Marathon. Kenyan runners finished in spots four through seven, and two more Ethiopians ended up in the top 10. The top American was London 10,000 meter Olympian Dathan Ritzenhein, who came in ninth with a personal-best time of 2:07:47. By topping the Kenyans, Kebede also beat Wesley Korir, the winner of this year’s Boston Marathon and one of the favorites to win Sunday’s competition. Korir finished fifth with a time of 2:06:13, more than 90 seconds behind Kebede. Korir started strong, but was never in the top-four at any 5-kilometer split. Over a dreary Chicago morning, the Ethiopian trio simply overpowered the 29-year-old Korir, who said he fell off a little when the pace-setters departed. Korir and Kebede had a common enemy during the race: a numbing cold spell the arrived in the city a few days prior. The temperature hovered around 45 degrees, and the wind swirled just enough to make it feel a few degrees colder. Executive Race Director Carey Pinkowski said he believed that the conditions could have been beneficial for runners, citing Steve Jones’ back-to-back marathon wins in 1984 and 1985. Temperatures were in the mid- to low-50s in each race. But the elite runners, many of whom hail from Africa or South America, aren’t accustomed to the climate. Korir overcame cold, but did not defeat Kebede. The new record holder proved his worth Sunday. For more times and finishers, go to the official results page.